Basal cell nevus syndrome is an inherited disorder characterized by wide-set eyes, saddle nose, frontal bossing (prominent forehead), prognathism (prominent chin), numerous basal cell carcinomas, and skeletal abnormalities. 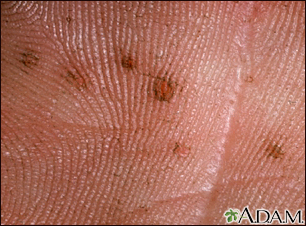 Skin manifestations include pits in the palms and soles, and numerous basal cell carcinomas. This picture is a close-up of the pits found in the palm of an individual with basal cell nevus syndrome.